Defective Search Warrant? Doesn’t Matter – The Good Faith “Loophole” Under Colorado Law – Many search warrants are the result of confidential informants – for whatever reason – tipping off the police of suspected drug sales occurring at a specific location. The issue in a recent case decided by the Colorado Supreme Court is how “stale” can the “tip” be before it is no longer reliable. The answer… it doesn’t seem to matter. People v. Cooper was decided by the Colorado Supreme Court on November 21, 2016. 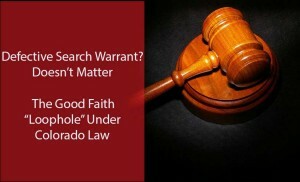 It explores the outer limits of the so called “good faith” exception to an admittedly Colorado defective search warrant. The lower court granted the Defendant’s Motion to Suppress Evidence (LINK) and the Supreme Court reversed that suppression order. The Fourth Amendment to the United States Constitution and article II, section 7, of the Colorado Constitution prohibit the issuance of a search warrant except upon probable cause supported by oath or affirmation particularly describing the place to be searched and the things to be seized. The warrant must establish probable cause to believe that contraband or evidence of criminal activity is located in the place to be searched at the time of the warrant application, not merely some time in the past. Probable cause exists when an affidavit for a search warrant alleges sufficient facts to warrant a person of reasonable caution to believe that contraband or evidence of criminal activity is located at the place to be searched. Probable cause exists by examining the totality of the circumstances. Whether information is current or stale plays an important role in the totality of the circumstances analysis. Whether the information is stale and cannot support probable cause depends on the factual circumstances and the type of crime. The exclusionary rule is a “judicially created remedy designed to safeguard Fourth Amendment rights generally through its deterrent effect, rather than a personal constitutional right of the party aggrieved. One exception to the exclusionary rule, the good faith exception, applies when, despite an otherwise invalid warrant, a trial court nonetheless admits evidence because the officer(s) that executed the warrant had a reasonable good faith belief that the search was in accord with the Fourth Amendment. The Colorado “good faith exception” to the exclusionary rule is found at section 16-3-308(4), C.R.S. This law providies that evidence that would otherwise be excluded as the result of an invalid warrant should be admitted when the officer’s conduct was pursuant to a “reasonable, good faith belief that the warrant was proper.” § 16-3-308(4)(a). (1) Evidence which is otherwise admissible in a criminal proceeding shall not be suppressed by the trial court if the court determines that the evidence was seized by a peace officer, as described in section 16-2.5-101, as a result of a good faith mistake or of a technical violation. (a) “Good faith mistake” means a reasonable judgmental error concerning the existence of facts or law which if true would be sufficient to constitute probable cause. (b) “Technical violation” means a reasonable good faith reliance upon a statute which is later ruled unconstitutional, a warrant which is later invalidated due to a good faith mistake, or a court precedent which is later overruled. (3) Evidence which is otherwise admissible in a criminal proceeding and which is obtained as a result of a confession voluntarily made in a noncustodial setting shall not be suppressed by the trial court. (4)(a) It is hereby declared to be the public policy of the state of Colorado that, when evidence is sought to be excluded from the trier of fact in a criminal proceeding because of the conduct of a peace officer leading to its discovery, it will be open to the proponent of the evidence to urge that the conduct in question was taken in a reasonable, good faith belief that it was proper, and in such instances the evidence so discovered should not be kept from the trier of fact if otherwise admissible. This section is necessary to identify the characteristics of evidence which will be admissible in a court of law. This section does not address or attempt to prescribe court procedure. The statute directs us to presume that an officer’s actions are in “reasonable good faith” when “the evidence was obtained pursuant to and within the scope of the warrant, unless the warrant was obtained through intentional and material misrepresentation.” § 16-3-308(4)(b). (4) where the warrant is based on an affidavit so lacking in indicia of probable cause as to render official belief in its existence entirely unreasonable. When the Defendant alleges the warrant does not contain enough information about the “staleness” of the information in the warrant affidavit, the Court then reviews the remaining information in the warrant itself. The Court therefore found that the affidavit, even if it was deficient as to when the so called drug sales actually took place – was saved from the exclusionary rule because it was not so “bare bones” that it could not meet the broad language found in the “good faith” exception. You should be careful to make a responsible choice in selecting a Colorado Criminal Defense Lawyer – and we encourage you to “vet” our firm. Over the last 30 plus years – by focusing ONLY on Colorado criminal law – H. Michael has had the necessary time to commit to the task of constantly updating himself on nearly every area of criminal law, to include Colorado criminal law and procedure and trial and courtroom practice. H. Michael works hard to get his clients the best possible results in and out of the courtroom. 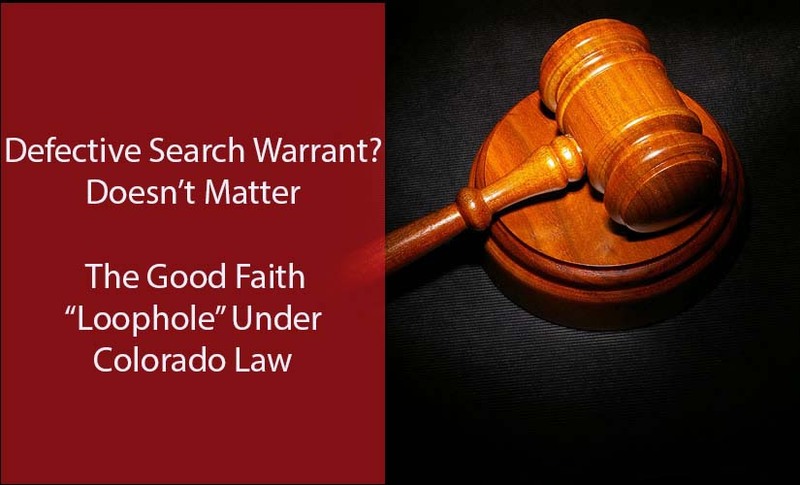 He has written, and continues to write, extensively on Colorado criminal law and he hopes this article helps you in some small way – Defective Search Warrant? Doesn’t Matter – The Good Faith “Loophole” Under Colorado Law. Many search warrants are the result of confidential informants - for whatever reason - tipping off the police of suspected drug sales occurring at a specific location. The issue in a recent case decided by the Colorado Supreme Court is how "stale" can the "tip" be before it is no longer reliable. The answer... it doesn’t seem to matter.